In a haze of weed, kickflips, shrooms and scraped knees, Nathan Williams became a slacker icon. The figurehead and driving force behind Wavves, Williams has soundtracked endless summers with his loud, heavy-duty take on garage rock. It’s now spanned across five albums – including this year’s V – and both Williams’ public profile and his quality of releases has risen exponentially in that time. Truth be told, there’s probably never been a better time to be a Wavves fan – V is as anthemic and engaging as anything he’s ever done before, and the live show – which Australian fans will be experiencing over the new-year period – is at a fever pitch. Music Feeds: Was that a buzzer or an alarm or something? Nathan Williams: Yeah, I’m playing basketball right now. MF: Seriously? With a team and everything? NW: Yeah, I get to do it sometimes when I’m off tour. It’s cool, though, we’re at halftime so I’m good to go. MF: Excellent. We’re here to discuss V, which might have one of the great contrasts of the year in that the musical side of things is very sprightly and upbeat, but lyrically you’re dealing with a lot of very dark and very heavy topics. Were these sides written in conjunction with one another, or were you putting one to the other after one was created? NW: It always depends. Mostly, with this record, it started with the musical side of thing. Lyrics came after that. There were three of us writing and working on this record – me, Alex [Gates, guitar] and Stephen [Pope, bass] – so there were a lot of different starting points. Normally, I just come up with a riff by myself and build it up from there, but there was a lot more involvement from the other guys this time around. MF: You’re dealing pretty honestly with growing up, getting old and losing control on V. Were you ever worried about giving away too much or oversharing at all? NW: I guess a little, at times. I feel like I’ve always given myself away a fair bit in terms of how I express myself through music. That’s part of the Wavves narrative, I suppose. It’s about what’s going on in my life, personally. That said, Stephen and Alex were also contributing lyrical ideas and stories about their personal lives, as well. There are some universal things that we all connected on. It’s funny…I’m totally fine with writing and singing about my personal life. I can tell things in a certain way. When it comes to actually talking about it, though, I don’t really like it. It’s a catch 22, because when people listen to your songs and they talk to you about them, that’s what they want to know about. MF: How have things changed in terms of opening up Wavves from being ostensibly your project to including Stephen and Alex, as well as Brian Hill on drums. 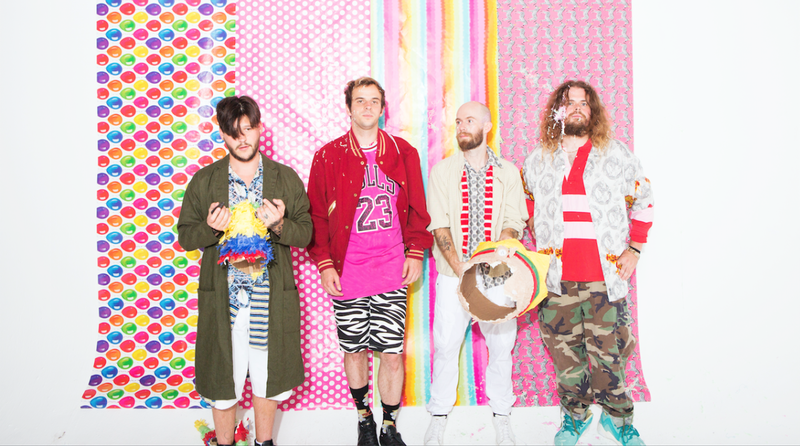 Were you at all reticent or reluctant about Wavves becoming a “band,” per se? NW: I don’t think so. It hasn’t been difficult at all. I’ve been playing with Stephen for over five years now. Alex has been with me for over three years. I always knew when I started Wavves that I was going to have other people involved eventually. At first, I just thought that meant I’d have friends to play with me live, but that changed after Stephen joined the band when I was making [third album, 2010’s] King of the Beach. I started to realise that it was a lot more beneficial to actually have Wavves as a band. I’d been through a lot of drummers and various people playing with me, so as this line-up settled it became pretty clear that this was Wavves now. People used to just see Wavves as me; but now it’s me, Stephen, Alex and Brian. Writing is easier and there’s a lot less pressure on me now to write entire albums by myself. We’re always bouncing ideas off one another. NW: That was really cool. It was a little bit harder, because Dylan lives so far away and has his own stuff going on with his band. Scheduling was the biggest obstacle for us, I think. We blocked out two weeks to record, and we basically finished the album in that period. There were minor things that we needed to change or record again, which we thought we’d be able to knock over the next time we were both free… and that ended up being nine months later. We somehow had a week of being in the same place at the same time, and we finished it from there. It was really fun to do – all our bandmates liked it and it was a cool experiment for us. We’ve actually got a 7-inch coming out next year – one side is going to have a demo version of No Life for Me on it, and the other is going to be a song we recorded with Rostam [Batmanglij] from Vampire Weekend that has never been released before. MF: You’ve always had some great music videos to go along with your songs – the alien invasion of Post Acid, the garbage-dump war of Demon to Lean On – but the video for V‘s Way Too Much might be your best. Are you a bit of a wrestling fan yourself? great show for the video. I’m definitely a big wrestling fan, yeah. I mostly watch WWE, but I’ve been watching wrestling for something like 20 years now. MF: The Mountain Goats did an entire album about wrestling earlier this year, Beat the Champ. Do you think you’ll ever give that a try? NW: [laughs] I mean, why not? MF: You’ll be back in Australia very soon for a run of dates around the Falls festivities. You’ve done your fair share of touring through here – what has your personal experience been like as far as coming to Australia is concerned? NW: It’s my favourite place to play outside of North America, no question. We’re always really excited when we get to come back. I think we’re spending New Year’s Eve in Byron Bay, which I’ve never had the chance to do before. I’m really excited at the prospect of that. MF: At your Sydney show a few years ago, when you were touring with Groovin’ the Moo, you and Stephen were screaming a very distinct phrase to one another on-stage – “YOU’RE BETTER THAN MICHAEL JACKSON!” Do you have any recollection of that? NW: [laughs] Oh, yeah. You don’t forget something like that. We were playing on the same stage as Andrew W.K. on the Groovin’ the Moo shows, so our backstage greenrooms were right next to one another. He had taken what I assume was a lot of acid – I don’t know what he had going on in there – and was talking to himself in his greenroom. We could hear everything. He was pacing back and forth, beating his chest to psych himself up for his set and just screaming to himself. “YOU’RE BETTER THAN MICHAEL JACKSON! YOU’RE BETTER THAN MICHAEL JACKSON!” It was infectious. We all started doing it, and it kind of became the catchphrase of the entire tour. MF: That might be the most Andrew W.K. story ever. NW: It’d have to be up there! V is out now. Waaves will be in the country soon as a part of Falls Festival as well as their own sideshows. See those dates here below.